The College of the Environment is here to help you understand what journalists need, ways to connect with them and set you up for success in interview situations. College of Environment communications staff are always here to help you think about how best to connect with or respond to journalists. Need assistance? Let us know! Email us at coenvcom@uw.edu. A journalist’s first responsibility is to their audience. They have to pitch their editors or producers with timely, relevant, compelling stories. Today, metrics matter: even “big” issues won’t get much coverage unless stories about them are known to drive views, clicks or social shares. In our 24/7 media environment, reporters work under tight deadlines — think hours, not days. When experts can’t follow up fast, it’s on to the next source. And with revenue slumps and staff cuts, many journalists cover multiple beats. There aren’t many science desks and subject-focused science journalists left. The journalist’s code of ethics is also stringent: reporters could lose their jobs and professional reputations by sharing a story with sources before it’s final and published. What does a journalist need from you? Make yourself available. Respond in minutes or hours instead of days. Have a compelling hook. What’s unique about your work, and how is it relevant to the reporter’s audience? This will differ for each publication. 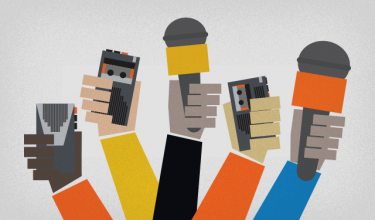 We can help you make the best pitch to the best potential reporter. Make it timely. Why is your story important now? Can you connect it to a hot topic or “evergreen” topic? Be clear and concise. Get to the point and get rid of jargon. Be your authentic self. Good stories have human connections. Make sure you’re part of your own story! Can you meet the deadline? What do you know about the reporter and the quality of their work? It is okay to decline a media request, particularly if you can recommend another source for them to contact. The College’s media team is always able to help you vet reporters — contact coenvcom@uw.edu anytime. Contact the College if you’d like help getting prepared, from developing messages to having practice interviews. Know your primary message. What’s the one thing you want people to remember? If they only take one quote from you, what would you want that quote to say? Use real examples, metaphors and/or personal connections to explain your science. Short answers, or “sound bites”, are key. Practice your sound bites out loud. Are your answers longer than 30-60 seconds? Shorten them and try again. Plan to speak in complete sentences, since the final story will not include questions or remarks from the reporter. Treat everything as if it is on the record, even if you are told it isn’t. Begin with and focus on what you know. Keep your tone conversational, confident and honest. Do not repeat false information or negative statements. Instead, answer a question using your own words and best messages. Embrace the awkward pause. There’s no need to fill silence. Let the reporter make the next move. It is ok if you don’t know the answer to a question. Say you don’t know, offer to follow up with the information later and bridge to one of your key messages. If it’s recorded, you can always ask to stop and try again. If you’re on camera, look directly at the reporter unless instructed otherwise. Send any requested information, as well as resources you think they should see such as graphics, statistics, papers and other visuals. Follow up with a thank-you note after the article appears, whether or not your quotes make the final cut. Share the piece on social media. How do I connect with journalists? Talk with members of the communications team at the College of the Environment and/or your UW News and Information contact. Keep a list of journalists that you like. Send an occasional note appreciating their work. Join Twitter and follow science writers and other scientists. Retweet reporter stories, but don’t pitch them on Twitter. Participate in communication workshops and attend events that journalists frequent, like Society of Environmental Journalists events. Maintain relationships with journalists you have worked with. Be your own science journalist through a personal blog, webpage or op-eds. The Marketing and Communications team at the College Environment can help you. We can provide more information, opportunities for training and practice, customized feedback, and more.